Who - WHO - suddenly decided that we are in the Christmas season?! Last night I saw two Christmas adverts on TV – one for furniture and one for air freshener – both with animated snowmen, Christmas jingles and the whole ‘Santa Claus is coming to town!’ jolly vibe. And today I’ve just returned from a shopping trip that can only be described as ‘festive’; mountains of stolen, mulled wine and boxes of shortbreads wrapped in tinsel in the supermarket, woolly coats and thick tights in various ‘winter’ colours in the clothes shop and packs of Christmas cards stacked to the rafters in the window of the newsagents. Even the chemist is selling Rudolph and Father Christmas shaped bottles of bath oil. Now I love Christmas as much as the next person, but it’s still early October! Did I miss the global decision to upgrade Christmas ahead of Halloween and Guy Fawkes Night on the calendar? And, most importantly, are we all in a hurry to dig out our old, drab and over-sized jumpers again? My summer wardrobe has had nowhere near the airing that it deserves and I am clinging to the desperate hope that we can still wring a few more warm days out of 2009. But it seems that God is on the side of the early-Crimbo brigade too. A number of friends have commented that this week has been cold, dark and… well… Christmassy. Last night I flicked the house lights on at 6pm because it was way too dark to see anything in my front room and I confess that I have switched the heating on three times this week. I’m even considering recovering several pairs of leather and suede boots from atop of the wardrobe to ensure that my toes will be toasty when I pop out to the shops. If marketing-land has decided that it is now officially Christmas-time and God thinks that it’s right about time for winter, then I might as well resign myself to it. They probably have some kind of Faustian deal going on between them anyway. Maybe I would be more inclined to accept that Summer 2009 is over if it had lasted just that little bit longer, but it feels as though we are seeing less and less of the sun each year. In fact, if summer-time is to be limited to two weeks in mid-August in future, then please point me in the direction of how to get this global-warming scenario off the ground. I might invest in a huge, gas guzzling 4x4 and install a smoke belching coal fire just to give it a shove in the right direction. Parched land and arid deserts all year round? I’ll take a dozen please! I too detest the Christmas season with the same passion that is generally reserved for debt collectors and STD's. And you are most correct, the Christmas season is indeed encroaching on our 'sane-season'. 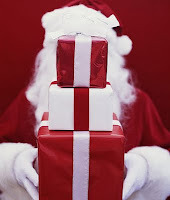 Alas, in Terra Australis, our culturally impoverished way only have Christmas and Easter as our major holiday moments. And I kid you not, Easter eggs are produced in supermarkets on Boxing Day, and then we get Tinsel and trees at about September!